Here’s a list of all the places I’ve lived. Some of the info from my early years is a bit vague. I suppose I could ask my mum for more details, but I’m not sure it’s that critical. 1982-5ish: 6/23 Pine Avenue, Elwood — this was great, being so close to the beach. I used to regularly get on my bike and ride up and down the beachside bike path. 1985-6ish: 1b Staniland Grove, Elsternwick — above a shop. The night was regularly punctuated by passing trams, shop alarms and the lady in the neighbouring flat getting rat-arsed. 1987-9ish: 6/27 Beena Avenue, Murrumbeena — right next to the Dandenong line. After about a week we didn’t notice the trains going by, apart from it drowning out the television. In year 11-12 I’d regularly meet up with a bunch of other students on the 7:40am train. 1993-1995: A flat at 166 Power Street, Hawthorn — the first time I moved out of home. From memory the phone number also ended in 1666, which was perhaps just co-incidence, or perhaps by-design, I don’t know. Being right next to the tram stop was handy, and in fact you could hear the city-bound tram coming around the corner, indicating if you wanted to catch it you might need to run up the driveway. 1995-2003: Booran Road, Glen Huntly — which was good, apart from being on a main road and having neighbours who occasionally left the TV blaring at night. Hmm, 16 places (in 38 1/2 years), which is more than I thought it might be. I know from going past and looking around on Google Streetview that most of them are still there, but many of them have been renovated and look little like they did when I lived there. I’ve lived in each home for about 8 years – plus three stints of two years (two years in Sydney, and renting two different places while building my home). I just added it up and I’ve lived in 16 places and I’m only 34. This doesn’t include 4 stints (4-6 weeks each) staying with relatives or friends when I was looking for a place to live after I moved countries. And I’m looking to move again – eek! LOL I probably passed you every day going to and from work at the private hospital in Booran Rd there! When I was born (1978) my parents lived in a 2br flat in Barkly St, St Kilda (it’s still there, unrenovated). 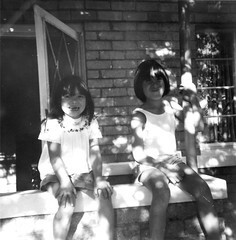 A year or 2 after they moved to Thomasina St, East Bentleigh, where my mum still lives (dad passed away). And when I was about 23 I moved to Ormond Rd, Ormond (ie. not very far away at all) and I’ve been there ever since. Nothing like the nomadic life you’ve had Daniel! I think the large number of homes just comes from having been in a family that rented, until I finally bought my current place. Chris, yeah for a while it was a running joke amongst some of my friends about how many boxes I had left still sealed in the spare room. Jayne, yeah, probably! The hospital was only a few doors down, but gone now, replaced by townhouses. I’ve always lived in Thornbury (close to Hutton). I have lived in 14 places myself. One was as short as 3 months and a few others were for a year. I have lived in 7 different states in the US and1 foregin country (Australia). I lived in my childhood home in Reading, Pennsylvania for 11 years and 9 months. I owned and lived in my condo apt. in Miami for 11 years and 7 months. I have lived in Australia for 1 year now. Daniel, were you born in Sydney or Melbourne? ugh, i’ve lived in 12 places (including London) in 34 years! One day I’ll settle somewhere, I hope! Jed, yes, I was born in Sydney. Do you intend to stay in Australia? At what point will you not consider it a foreign country anymore? Shaz – some familiar streets and place names there! Daniel, I do intend to stay here in Australia. It might have been better to say “another country” as Australia is no longer a foreign place to me. To the average person in the US Australia would be considered a very far away and exotic place to visit let alone live in. WOW! … what a random place to find people from Moora! My count comes in at 11 places in 27 years, Newcastle, Sydney, Adelaide, Hobart and back to Sydney. and soon to move to BRUNSWICK YEAH ! Not many for 47 years.